Our first anchorage on LIS was in the outer harbor of Mamaroneck. It's the only place nearby that we could secure a mooring and we did not want to be at a dock. Since the inner harbor is jammed and has a long waiting list, we opted for a mooring in the rather exposed outer harbor. We got a space for our dinghy at Nichol's and prepared for the long trip out to our mooring every weekend. Luckily, that's not the case any more, but we certainly got to know Mamaroneck pretty well. Milton Harbor looking toward Peningo Neck and American Yacht Club. The approach to the two harbors from LIS starts at R42. It is best to heed the "red right returning rule" as the rocky outcropping, called Scotch Caps, at Milton Point has some rocks extending pretty far out from it. The entrance to Milton Harbor (Rye) is to starboard with the channel running between Hen Island and Peningo Neck that you can line up by passing between RG MM and RN 2. It pays to give both of these marks distance as they both have rocks behind them - ship rock at 2 feet below the surface behind MM has claimed many victims. 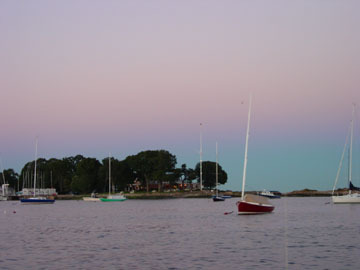 The outer harbor is the mooring field for American Yacht Club, one of oldest clubs on LIS and host to several important regattas throughout the season. The fleet consists mostly of sailing yachts of all descriptions and is a joy to inspect. The depth on approach to the American Yacht Club is 6-7 feet MLW. The channel to Rye is supposed to be 6 feet but it has not been dredged in the time we've been there so we cannot vouch for it. The only anchorage is off the tip of Hen Island which is quite exposed in a SW swell. American does have a few guest moorings for members of clubs with reciprocal priviledges. Getting to Rye town from here is also not so easy - there are three delis, a pizza store and an upscale restaurant within walking distance, but it's a good stretch. The center of town is too far to walk. What is great out here, is the nature preserve at Marie's Neck and Pine Island. 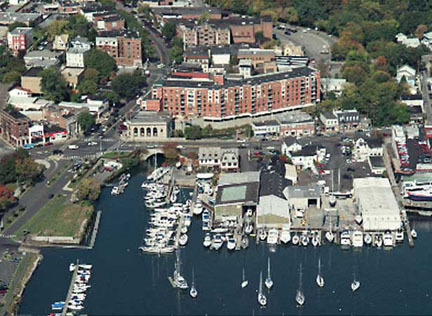 Mamaroneck Harbor does not have any available anchorage inside the inner harbor. You can go in for fuel and supplies at Brewer's (channel to starboard at the RG "A") but they are usually overbooked with boats at their docks. The approach is tricky so be sure to follow the charts and channel with great care. There are also two yards in the port channel (Nichol's and McMichael's Rushmore) but they are all dedicated to seasonal dockage. There are numerous private yacht clubs in the area including Sheldrake, Beach Point, and Orienta, but the only club that is accessible to non-members is the Mamaroneck Beach and Yacht Club. The only other choice here then is to anchor in the outer harbor, also exposed in a southwesterly, and face a long dinghy ride into town. There is no dinghy dock but Brewer's or McMichael's yacht yards may allow you access. Their facilities are right on Boston Post Road. Brewer's Post Road Boat Yard in Mamaroneck. Photo from Brewer's. Brewer's has a full service marina and chandlery/hardware store that is among the best anywhere. It is the original Brewer's location. If you are a teak freak, check out their woodworkers shop in the back. Teak, teak and more teak, trim, every variety and grade of marine ply you can imagine, a wall of glues and another of varnishes. It's a woodworker's heaven. Next door is the famed Derecktor Shipyard where monster yachts and ferries are built and serviced. Across the street is American Marine Canvas, a great source of dodgers, sail covers, biminis, cushions, and so on. 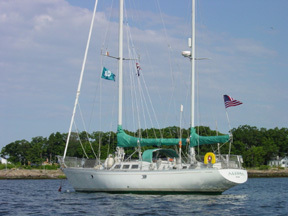 A short walk down is McMichael's, a yacht brockerage with full service yard and haulout facilities. Along the way is a chain burger restaurant and a pretty good diner. Walking in the other direction, the main intersection at the park is Mamaroneck Avenue where you can find just about anything you need, from ATMs, to an Army-Navy surplus store, fantastic Italian delis, fast food services, antique stores for browsing, and a really good restaurant called Le Provencal Bistro. Not from from the harbor but certainly not within walking distance is the famed Playland Amusement Park. The good news is that Westchester has dropped moorings just off Playland for boaters to come in an enjoy the beach, the rides, and the fireworks. There are also several restaurants to choose from including one with expansive views of the Sound. Mt. Kisco, NY - Boaters can take to the “high seas” of Long Island Sound and visit the area’s most famous amusement park  Playland in Rye - by docking at new moorings installed at the historic park. Playland has two 300-pound and four 200-pound moorings available for docking for small and large vessels. The moorings are located at 20 feet of water at high tide off of Playland’s wading beach at the northern end of the park parallel to the pier breakwater. After docking, boaters radio to channel 67 to request pickup by the Playland launch operator who will bring visitors to the shore at the park. The launch operator can assist in docking vessels and can transport up to six passengers on each trip to shore. Service is available Tuesdays through Sundays and Monday, Labor Day from 12 noon until 8 p.m. Last trip back to the moorings is at 7:30 p.m. No boat operators other than those employed by Playland will be allowed to come ashore at the park. Playland is owned and operated by Westchester County Parks. Playland Park is known as America's first totally planned amusement park and was designated a National Historic Landmark in 1987. Playland is located in Rye , and can be reached by car or bus via the New England Thruway (I-95), Playland Parkway exit 19. For more information, call 914-813-7010 or visit Playland at www.ryeplayland.org.